One of the more interesting discussions raised about videogames in recent times has been about the merits, or lack thereof, of locked content. On one hand, linear progression through games has been the norm since the days we first started pumping quarters into arcade machines. On the other, it's inherently exclusionary: If you lack the patience or the skills to make it to the end, you simply miss out on whatever content may lay beyond your reach. That won't be the case in the upcoming Call of Duty: Black Ops 3, however. Instead, as Campaign Director Jason Blundell told Eurogamer, all campaign missions will be unlocked right from the start, so if you want to flip to the last page and see how it ends, so to speak, you can. "The unlocking level system is an archaic mentality we've had since we did bedroom development back in the day—you do this, then go on to the next one," Blundell said. "Consumers and game players in general are far more mature these days. There are so many things vying for our interests today. It's about, how do they want to consume it? Maybe they put it down on level two, and then they're in work the next day, and some guy says, 'Dude, you've got to check out level four!' And he's like, 'Okay, I'll have a quick look.' That's totally fine. I think it's their choice." As for concerns that impatient gamers will spoil themselves, Blundell believes that those who leap straight to the end will want to understand more about how the game reached that point, and will end up going back and playing the earlier levels anyway. "The way the story is constructed, it's more than just the end moment," he said. "I'm sure there are many films and other media types where you could read the last page, or see the last minutes, but really you've got to experience all of the other stuff to truly enjoy it." I was initially surprised that the Call of Duty franchise would be at the forefront of this movement toward increased accessibility, but the more I think about it, the more it makes sense. For one thing, I don't think it's entirely unreasonable to say that most CoD fans don't care much about the single-player campaign anyway, and so it's relatively safe to mess around with it. But the real motivation is probably the simple fact that the Call of Duty franchise is stagnant. 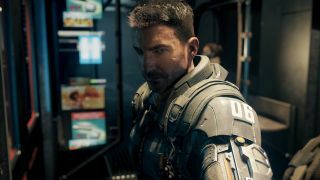 Sales of last year's Call of Duty: Advanced Warfare were down considerably from the previous year's release, CoD: Ghosts, which were themselves down from 2012's CoD: Black Ops 2. Even Black Ops 2, which made a boatload of money, was sufficiently off the Modern Warfare 3 mark for one analyst to call it a "cause for concern." That gives Activision a powerful incentive to do something dramatic to boost interest in the series, especially among gamers who aren't already committed to it. Will opening up all the campaign levels right from the start be enough to do the job? I can't imagine the appeal of playing a game out of order, but I also paid close attention to the Painkiller cutscenes so I'd know what was going on. I might be the wrong person to ask that particular question, in other words, so I'll ask you instead: Does launching with all campaign content unlocked make Black Ops 3 a more appealing prospect? Call of Duty: Black Ops 3 comes out on November 6.